wanderlust ATLANTA: 3D Printing...at MODA! Have you done any 3D printing yet? Your chance is coming up...very soon. 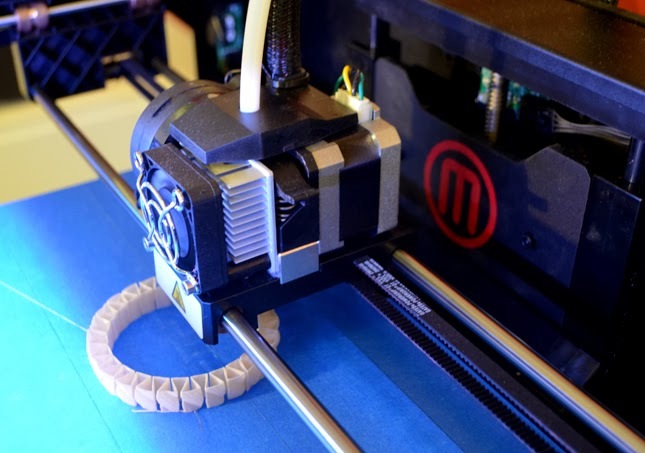 The Museum of Design Atlanta (MODA) entered into a partnership with MakerBot to bring in three 3D printers—in conjunction with the Hidden Heroes: The Genius of Everyday Things exhibition—on display, and available for use, in MODA's Design Bar. 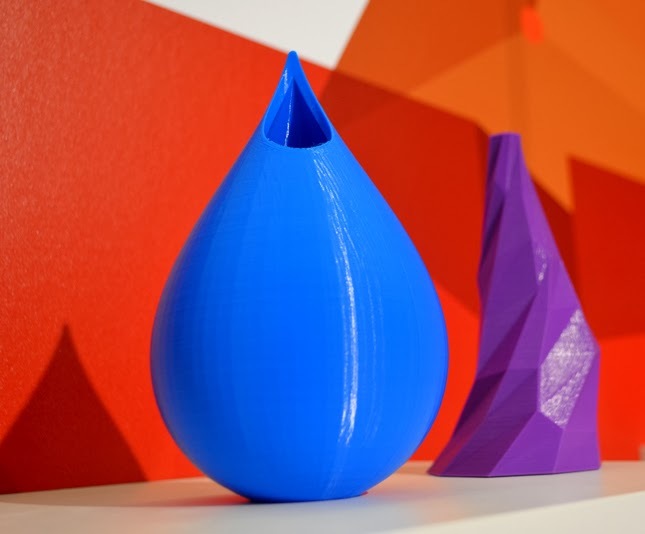 Why couple 3D printers with an exhibition that features everyday objects, many of which are hundreds of years old? It's all about industrial revolution...and 3D printing is just that. 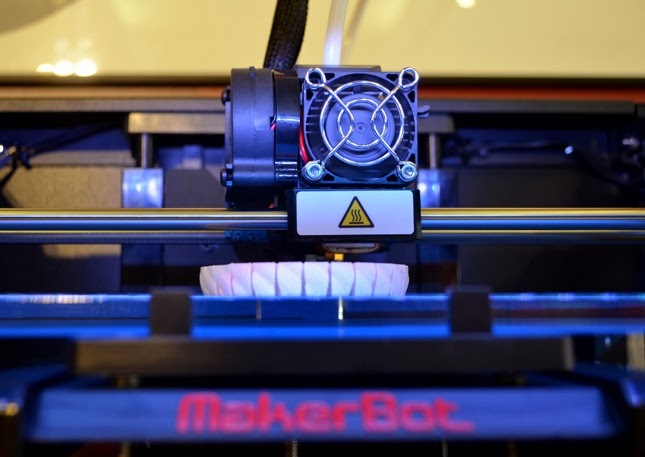 In fact, Forbes has predicted that 3D printing will be a $5 billion industry by 2020. I'd arrived to the Museum a little early for last week's Hidden Heroes tour. Before it started, Sam Cone, one of the Visitor Services staff, gave a small group of us visitors a highly enthusiastic explanation of 3D printing. Sam is brilliant...I learned more about 3D printing from him in a few minutes than I have in casually following the technology for years. Speaking of years, I had no idea that 3D printing—also known as stereolithography—has been around since 1986, when it was invented by Chuck Hull of 3D Systems. And I was shocked to learn that the printers on display at MODA cost a mere $2,000 each. 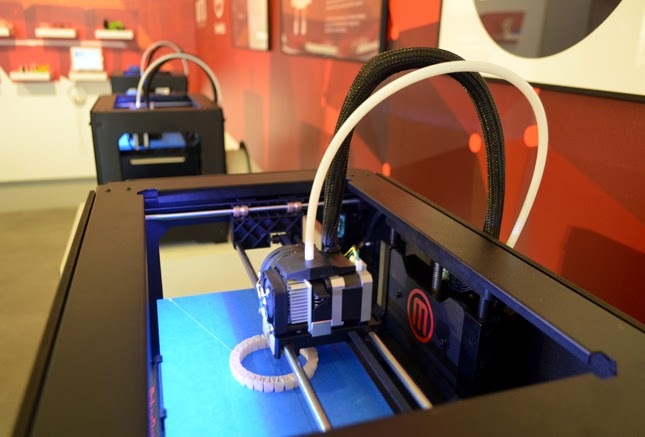 You can imagine that 3D printers will be a household appliance in the not too distant future. So, when you're at MODA watching these printers in action, you see how they lay down layer after layer to create what they're printing. One of the things that I noticed first was that the "inside" of the items being printed had a honeycomb structure. Sam explained that there are various options for the interior, and that by it not being solid, you save money on materials and the object is lighter. Sounds good to me! And the printer builds the object by laying down successive layers of material. How easy is that?! 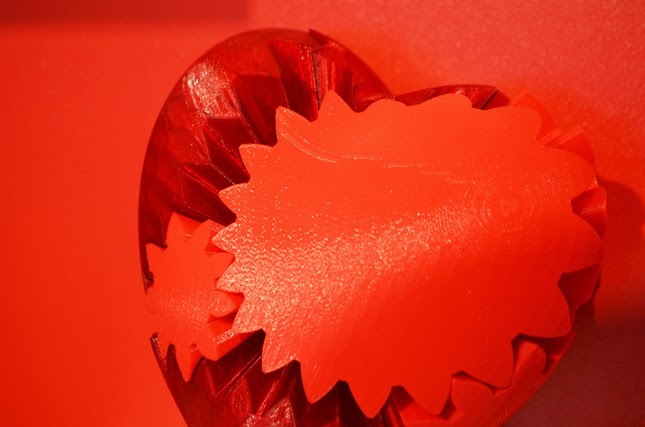 You can see very quickly how 3D printing is changing the way we think and approach "innovation, design, and distribution of everyday objects." If you're not totally fascinated by the potential of 3D printing just yet, consider this. There are people already using 3D printing to create prosthetics for their children who are born without fingers or hands. 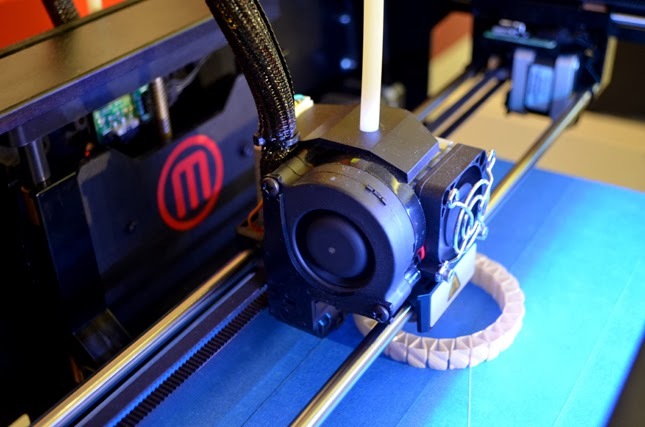 3D printing is allowing individuals to make replacement parts for gadgets, mitigating high cost and shipping time. 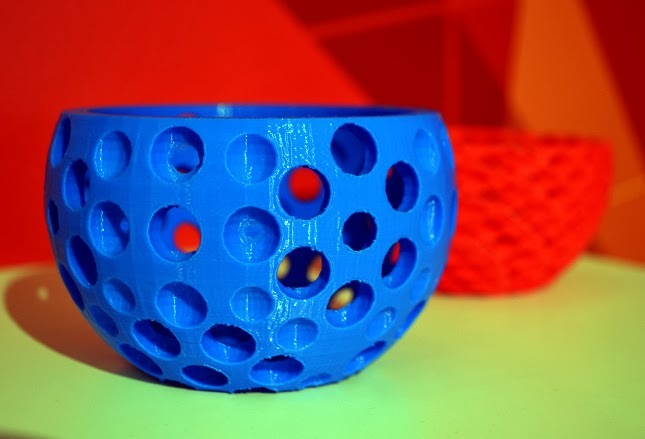 3D printing is allowing inventors to print prototypes, saving them a great deal of time. The possibilities are truly endless! 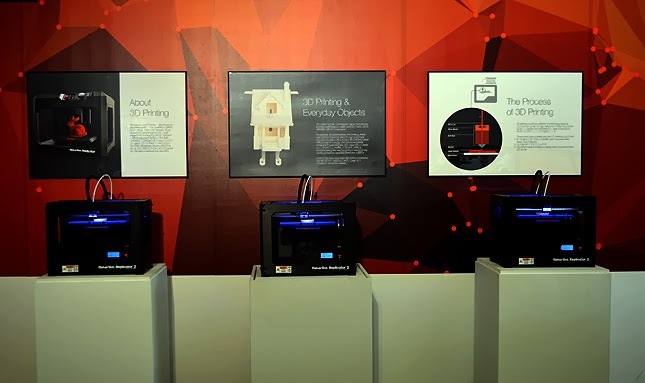 MODA has the three MakerBot printers on display, as well as a wall of objects that have been printed at the Museum—the photos in this post show some of those objects. I tried to identify a favorite, but I just couldn't...I'm so blown away by the whole process and each object carries with it a unique fascination. The 3D printers on display at MODA are the MakerBot Replicator 2. It turns out that MakerBot has quite a few 3D printer products and I can only imagine that their and others' product lines will grow exponentially over the coming years. So, allow me to repeat a question that MODA asked on their Facebook page today..."If you could 3D print anything, what would it be?" I mentioned that you have opportunities to dabble in 3D printing...and it sounds like so much fun! MODA is offering, in addition to the Design Bar opportunities, various make-you-own classes through their "Hands on Design" program. The tuition is very reasonable, especially for Museum members. And the range of objects to be made is impressive...I have so many ideas! 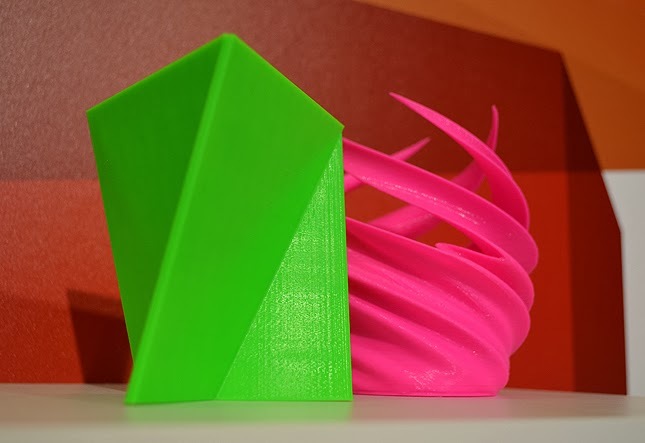 This unique opportunity, bought to you only by MODA, invites visitors to check out the upcoming 3D printing classes and to also stop by the Design Bar for a session in creativity and design...you can customize and create your own 3D printed object! Totally cool, right?